Give Your Child the Gift of a Beautiful, Healthy Smilewith Two Phase Orthodontic Treatment! Mouth breathing can cause narrow arches and unattractive smiles. By using functional appliances while children are actively growing, we can help them achieve a broad, beautiful smile. Early use of Functional Appliances can prevent or eliminate these problems. Mouth breathing can lead to orthodontic problems as well as other problems, such as lack of oxygen and poor sleep habits. This leaves children prone to daytime fatugue, an inability to concentrate in school and headaches. Deep overbites and receeding lower jaws may cause earaches, stuffiness or ringing in the ears. If infection has been ruled out, Functional appliances can eliminate these symptoms effectively. Narrow jaws can confine the tongue and interfere with normal speech. Functional appliances help ensure proper growth and greatly enhance a child's ability to speak normally. Parents want the best for their children; straightteeth, properly sized jaws, straight profiles and beautifulsmiles.By treating problems early, you save money and may prevent the need for more extensive future treatment. Crowded teeth are caused by narrow arches.By developing the arches at an early age, we may prevent or eliminate the crowding of permanent teeth.Another advantage is that early treatment often eliminates the need to remove any adult teeth. Let us meet your child's orthodontic needs as early as possible!It is critical to correct any functional or jaw problems as soon as they are diagnosed. Get your child's smile off to a healthy start! 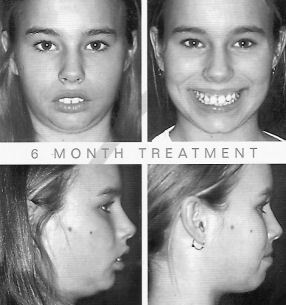 Seventy-five percent of 12 year olds need orthodontic treatment. Yet 90% of a child's face has already developed! 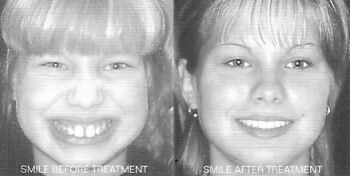 By guiding facial development earlier, through the use of functional appliances, 80% of the treatment can be corrected before the adult teeth are present! Younger children between the ages of 8 and 11 are often much more cooperative than children 12 to 14. Another advantage of early Phase One treatment is that children will need to wear fixed braces on their adult teeth for less time. Almost 50% of children who need orthodontic treatment due to a bad bite have underdeveloped lower jaws. Functional appliances can reposition the lower jaw forward, improve the child's profile and correct the bite problem - within 7 to 9 months! See what a difference functional appliances made to this young girl's profile!